Dec. 17-18, 1943: what will the future hold? Dec. 17 – Mac and I went down town this evening and had dinner in Andria – Italian spaghetti. We had a grand talk. Dec. 18 – Left Andria at 9 a.m. for Avellino about forty miles from Naples – travelled over part of the road we passed on the attack of Motta. Had a grand trip, 120 miles through the Mts. Landed in 2nd F.D.S. (Field Dressing Station) to be met by Jack Sturdy O.C. (officer commanding), given a wonderful reception. SBO (Standard Battle Order) here and Sgt. I know very well. It has been grand. I seem to be awfully well known by reputation. Given the best of everything here and in No. 1. Talked to Col. Hunter on the phone – I am going to stay here until Thursday, when he will see me and talk things over. What is the future? I don’t know. Am going to have a darned good sleep here tonight and am being given a car tomorrow for sight seeing. Again all squadrons remained in their present positions during the morning. 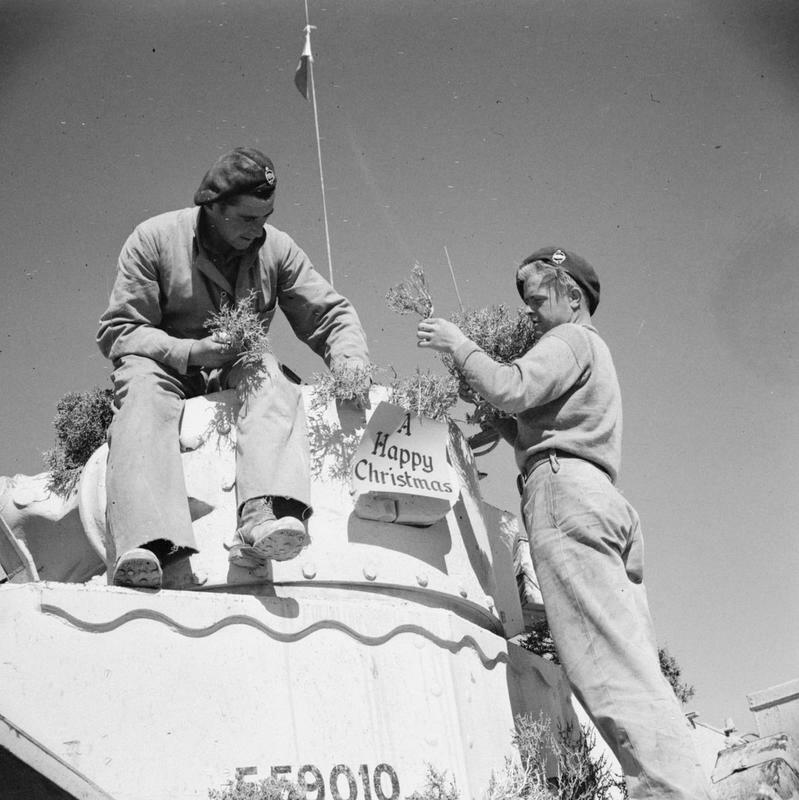 A and C Sqn are still consolidating on Vino Ridge, in support of the infantry. Slight infantry gains have been achieved during the past few days, but no major attacks have been launched, and no tank support has been required. B Sqn was again active during the day, when it was decided to put in an attack on the high ground to the front of the present position with an objective of taking the height and some buildings on it. While moving forward, one tank blew up on a mine, but no casualties resulted. The attack was successfull, and infantry and tanks consolidated the position for the night. During the day, three reinforcement tanks complete with crews were received by the Sqn, to bring its fighting strength back to par again. Throughout the day, all Sqns remained in consolidation role with infantry on present positions. Artillery and mortar fire on both sides was heavy. It has been decided to bring up the 12th Cdn Arm’d Regiment to relieve the 14th Regt and to make another assault on the cross roads that have been so long held by the enemy Accordingly, as darkness fell, the 12th Regiment moved up to the 14th positions. This unit will now move to an assembly area tomorrow where unit tank and personnel strength will be built up and all ranks will have an opportunity to rest. B Sqn, on the extreme right will not move tomorrow, but will be relieved gradually during the next four or five days. In A echelon area, preparation for the move to the new area was completed. The Echelon is to move at 0900 hours tomorrow morning. 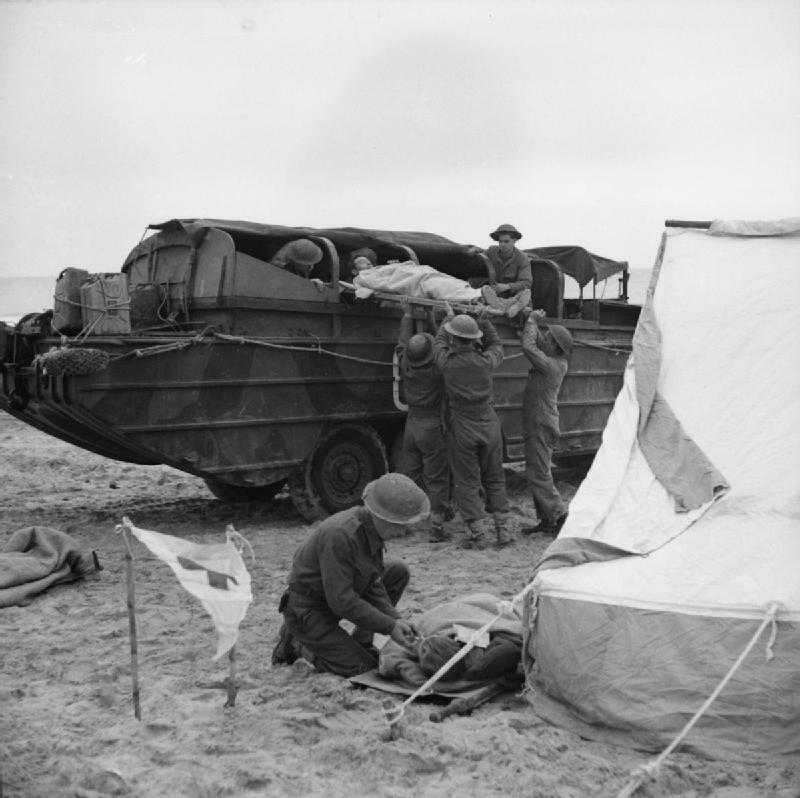 Note: Doc Alexander is will soon return to England where he’ll be promoted to major and given command of the 6th Field Dressing Station and then, with the 6th FDS, he’ll be sent to Normandy on D-Day plus-21. For now, he’s still in Italy, convalescing in a Canadian hospital following the sharpnel wound to his ankle. As part of this project is as much about The Calgary Regiment as it is about my grandfather (even though he had been with the 2nd Field Ambulance through Italy), I’m going to keep telling both stories even though they have diverged. Even though my grandfather has been separated from his beloved Calgary Tanks, it is never far from his mind. X ray negative on ankle, so guess it is ligaments. Bob and Ralph are back, will be leaving for Unit tomorrow. Saw Nurse McDonald from Calgary today – we had a long talk, she will be in later. Throughout the day, the combined A and C Squadrons remained in positions on Vino Ridge with infantry. A small scale enemy counter attack during the afternoon was repulsed with few casualties. On the B Sqn sector, the position remained unchanged. The enemy made strong bids several times during the day to throw back the force, and tanks were called forward to repel these attacks. All attempts by the enemy to take the position were repulsed, but infantry casualties were high. No tanks were used by the enemy in these attempts and the enemy infantry suffered heavily. Scattered shelling of A1 Echelon areas continued throughout the day. Again, no change in the combined A and C Sqn position was reported. Tanks remained on their positions all day to give support to the infantry should it be required. Supplies on the B Sqn sector were running short due to the fact that the roads to this position were under constant shellfire, and cross country routes were impossible for the wheeled or tracked vehicles owing to the deep ravine to the rear of the position. Accordingly it was decided to bring up a mule train consisting of 40 mules. This was organized by Major F. Schmidlin, 2nd in Command Regiment, and S.S.M. C.R. H Alstead of B Sqn was entrusted with the task of getting the mules through. Under cover of darkness, the train left the A echelon area and proceeded across country to the B Sqn area. Out of the 40 mules that started, only 18 arrived at the Sqn area which was reached at approximately 2100 hours. However these relieved the immediate shortage. The day had been rather hectic for B Sqn, who, with supplies of ammunition running out, were called upon several times to assist in the repelling of the counter attacks by the enemy. Ammunition was shifted from tank to tank during the day, and all attempts were successfully repulsed. Col. Hunter visited me this a.m. They are x-raying me here and shortly will send me to Naples XIV C.G.H. (14th Canadian General Hospital). I will probably work there until the draft returns to England. Expect to visit the Isle of Capri when there. Am being used sweet here so far, am perfectly happy. 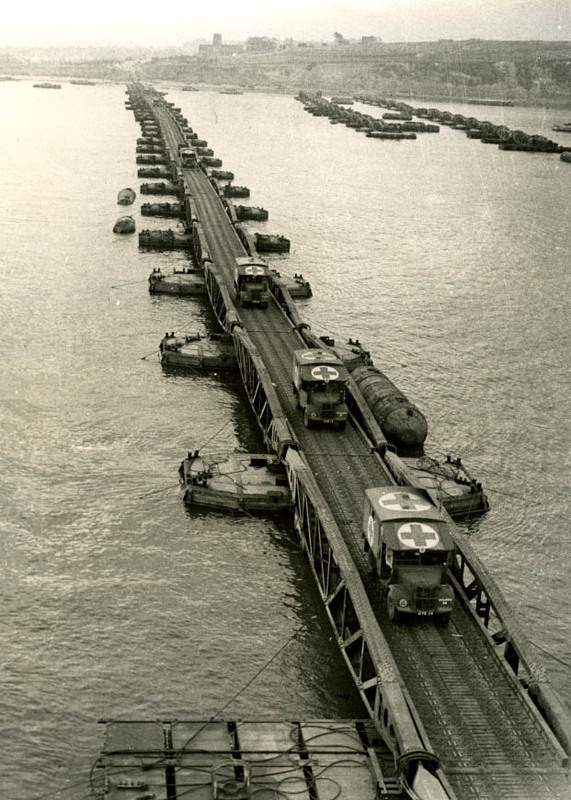 Bailey bridge, Second World War. Alexander family collection.